Oil from an Iranian tanker that sank in the East China Sea has diffused into four separate slicks, covering a combined area of just over 100 square kilometers. A Chinese rescue ship works to clean oil slicks from the sunken Iranian oil tanker Sanchi in the East China Sea in this January 15, 2018 handout picture released by China's Ministry of Transport on January 17, 2018. 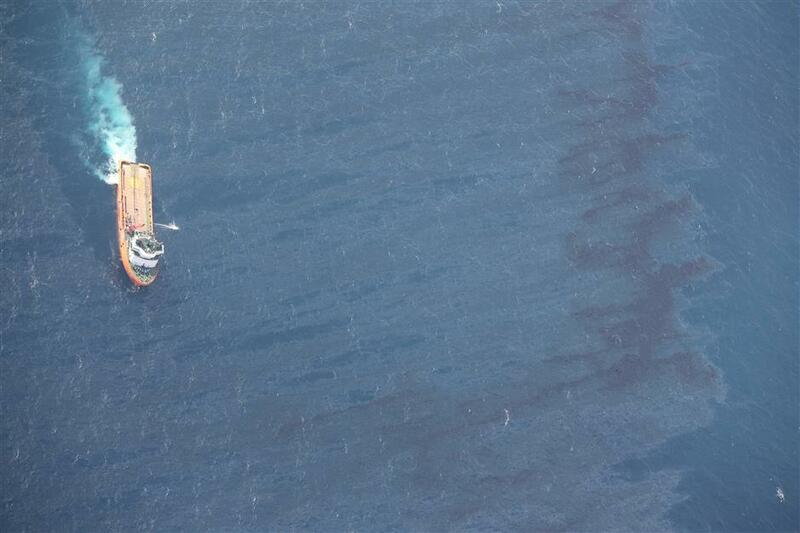 Oil from an Iranian tanker that sank in the East China Sea has diffused into four separate slicks, covering a combined area of just over 100 square kilometers, Chinese authorities said on Thursday. Earlier satellite imaging showed two large slicks, with the larger one also thicker and more concentrated, but the latest data had found four slicks ranging in size from 48 square kilometers to 5.5 square kilometers, the State Oceanic Administration said. The large tanker Sanchi sank in the worst oil ship disaster in decades on Sunday, raising worries about damage to the marine ecosystem. The bodies of two sailors were recovered from the ship while a third body was pulled from the sea near the vessel. The remaining 29 crew of the ship are presumed dead. The Chinese Ministry of Transport said on Wednesday a salvage team had located the wreck, which was at a depth of 115 meters under sea level, and was preparing to send underwater robots to explore it. The SOA said on Thursday it had collected water samples from 19 spill sites, and found water from five sites had petroleum substances at levels exceeding standards. Clean-up teams were continuing to monitor the wreck area to assess the drift and diffusion of the oil spill and the ecological impact. One of the slicks, about 18 kilometers in length and 300 meters wide, was found about 11 kilometers north of the sunken tanker, and another, about 20 kilometers long and about 500 meters wide, was found 2 kilometers southwest of the wreck, it said. The Sanchi had been adrift and ablaze after crashing into the freighter CF Crystal on January 6. Strong winds pushed it away from the Chinese coast, where the incident happened, and into Japan's exclusive economic zone. The ship was carrying 136,000 tons or almost 1 million barrels of condensate - an ultra-light, highly flammable crude oil.